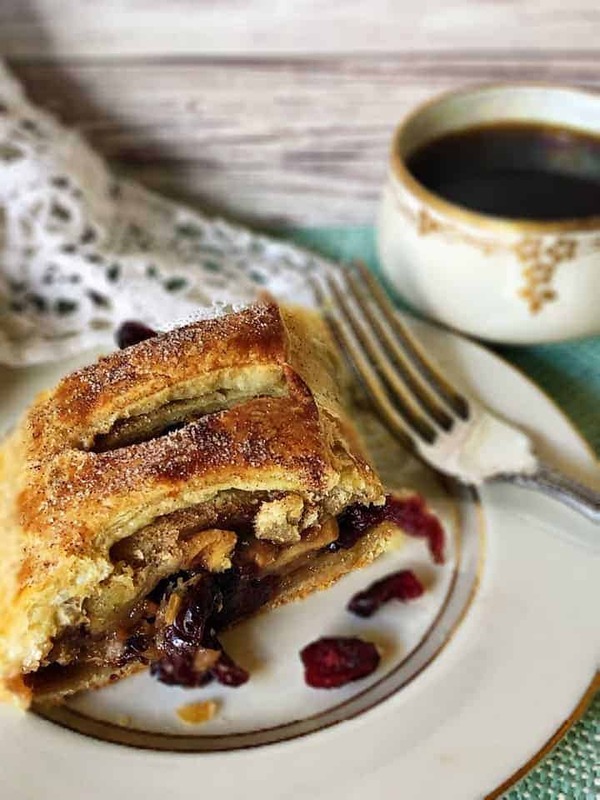 This rustic Apple Cranberry Strudel is vegan, easy and delicious! 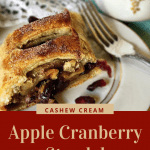 It is filled with apples, cranberries, pecans, and a secret ingredient: a homemade cashew cream! 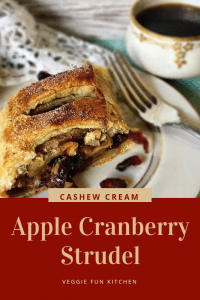 Once you make the apple-cranberry filling and cashew creme, it’s easy to throw together using purchased frozen puff pastry sheets. Disclaimer: This post contains Amazon affiliate links. Clicking on those links and making a purchase may provide Veggie Fun Kitchen with compensation at no additional cost to you. 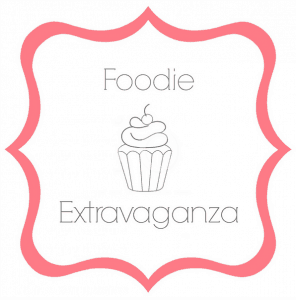 This post is part of the Foodie Extravaganza Party! 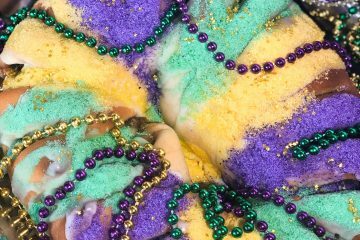 Every month a group of food bloggers gets together to bring you theme-related food from around the WWW. They may not all be vegan dishes, but perhaps can be modified. 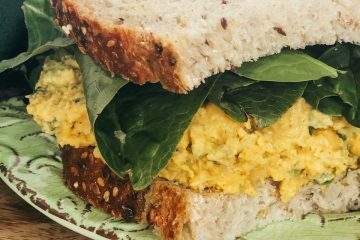 I’m thrilled to be a part of this group – I think it helps to get the message out that vegan food can be fabulous! Please see below for links and please visit the recipes that might interest you. 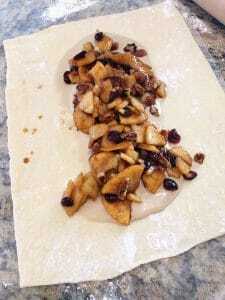 So you ready to made some Puff Pastry Apple Cranberry Strudel?!? Start with a box of frozen puff pastry sheets. This recipe will make two long strudels; but you can eat one now and freeze the second one for later! Set the pastry sheets out to thaw according to package directions. These puff pastry sheets take about 40 minutes to thaw on the counter. This should be plenty of time to prepare the apple-cranberry mixture as well as the cashew cream. 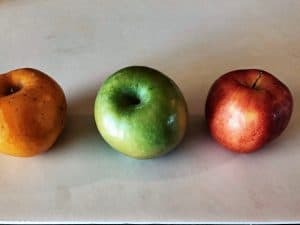 This recipe calls for three apples. Using three different types of apples gives it an interesting, undefined, apple-y flavor. Peel, core, and slice your apples. 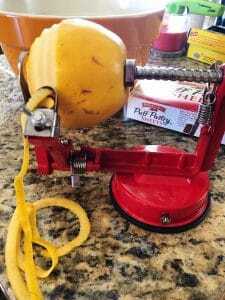 Honestly, this apple peeler (affiliate link) is the way to go. It’s so easy that even kids can do it (with supervision of course)! 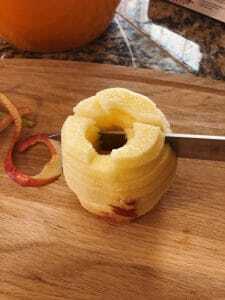 After I peel core and slice with the peeler, I can easily cut the apples again into quarters and get just the right size. 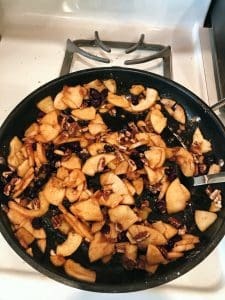 Add the apples to a deep sauté pan along with the sugar, seasonings, and arrowroot powder. I also add orange juice concentrate for an added flavor zip. 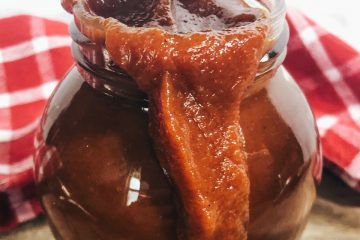 I always keep a jar of frozen orange juice concentrate in the freezer so that I can dig in and get a little orange flavor whenever I need it. Stirring constantly so that the sugar doesn’t stick, cook for about 3-5 minutes until the apples have softened. Turn off heat and add cranberries and chopped pecans. Next, start working on the cashew creme. Make sure you drain the cashews. 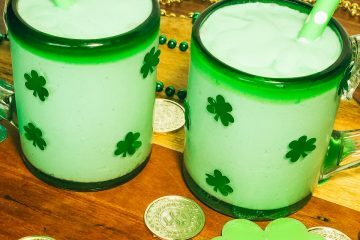 Add to a high-speed blender (affiliate line) along with the other ingredients and blend for several minutes until smooth. This is just about the right time for the puff pastry to be thawed. 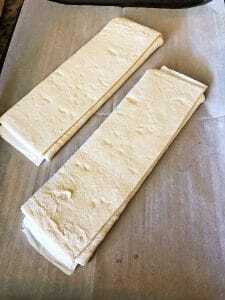 On a floured surface, gently open one and then roll out into a 10×12 rectangle. Make sure the folds are going horizontally. 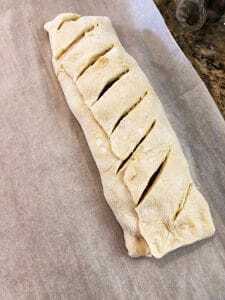 This way when you complete your strudel, and fold over, there will be less chance of breakage. Roll your rectangle out so that the folds are horizontal. Pour half of cashew creme down the center and then carefully place half of the apple cranberry mixture on top. Center the Cashew Cream and apple cranberry mix right down the middle. Fold over one third, covering the mixture, and then the fold over the other side so that you have a long tube. Gently tuck each end under. 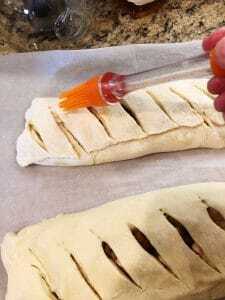 Carefully place onto parchment paper and then cut diagonal slices through the top of the each strudel – about one inch apart. Brush the tops with some sugared cashew milk. Bake on the center rack at 375° for 15 minutes. Take out of the oven and sprinkle each with cinnamon sugar. Return to the oven and continue baking for about 15 more minutes or until the pastry is puffed and lightly browned. Brush with a plant milk/sugar mixture. Allow to cool slightly before carefully slicing. Serve warm or cooled with your favorite hot beverage. You can wrap one of the strudels up and freeze until you are ready to eat. If you freeze one and want to eat it later, wrap it tightly in foil. Later you can reheat – still in the foil – at 350° for about 30 minutes. 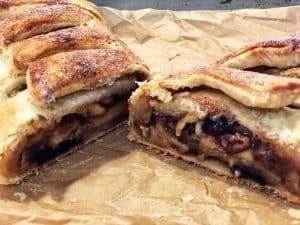 These are some items I found helpful in making this Puff Pastry Apple Cranberry Strudel. All are Amazon Affiliate links. 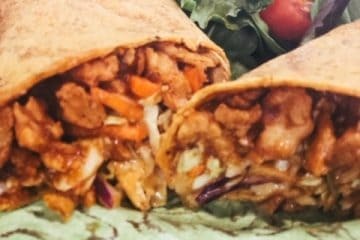 Clicking on and purchasing may earn Veggie Fun Kitchen compensation at no additional cost to you. 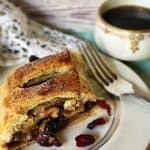 This puff pastry apple cranberry strudel is vegan, easy to make and perfect for a cool crisp afternoon. 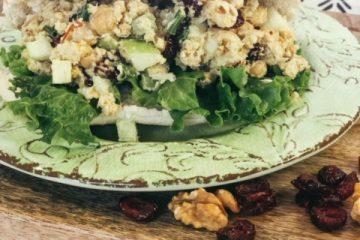 It uses a homemade cashew cream, apples, and dried cranberries. Set pastry sheets on counter to thaw. Thaw according to package directions. My package directs 40 minutes. 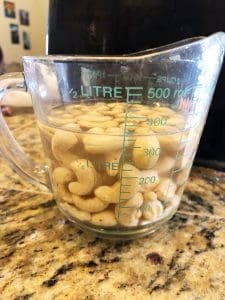 Drain all water from cashews. 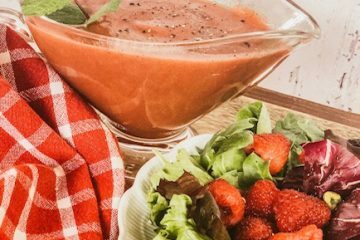 Add to a high speed blender along with cashew milk, lemon, arrowroot powder (or cornstarch), salt, and brown sugar. Blend on high speed till smooth. About 5 minutes. While cashews are soaking, you can make your apple cranberry mixture. Peel, core, and slice three apples. I like to use different varieties. 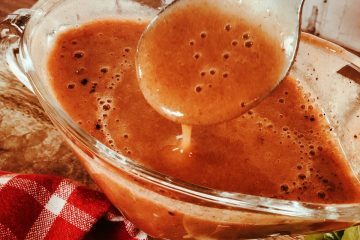 Put prepared apples into a sauté pan along with brown sugar, orange juice concentrate, cinnamon, arrowroot powder (or cornstarch), and salt. Cook, stirring constantly to keep sugar from sticking, till apples have softened - about 5 minutes. Remove from heat and stir in dried cranberries and chopped pecans. 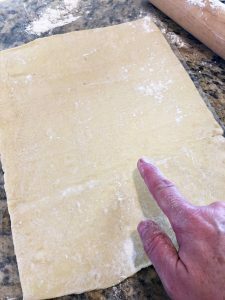 Working with one pastry sheet at a time, gently unfold pastry onto a floured surface and with a floured rolling pin, gently cool into a a rectangle - about 10x12. Make sure the "folds" are going across horizontally (the short way). Pour 1/2 the cashew mixture down the center of the pastry sheet, being careful to leave 1 1/2 inches on the top and bottom of the rectangle. Carefully spoon 1/2 apple cranberry mixture on top of the cashew cream. Carefully fold one side of the pastry sheet over, covering the mixture and then the opposite side. Tuck under the edges on the top and bottom to fully close the "tube". Carefully transfer to a parchment paper covered baking sheet. Cut diagonal slits about 1 inch apart across the top. Repeat with other pastry sheet. When you place the second filled tube onto the pastry sheet, make sure you space a couple of inches apart. Make a little sugar milk and brush on the top of each pastry tube. Bake at 375° for 15 minutes. Remove from oven and sprinkle some cinnamon sugar on the tops of each. 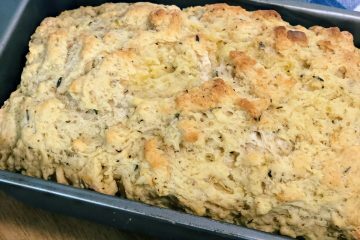 Return to oven and continue baking for 15-20 minutes or until lightly browned and puffed. Let cool slightly before cutting. To freeze unused portions, wrap tightly in foil. Allow to thaw naturally and then warm in a low oven (about 300°) for 15 minutes to reheat. 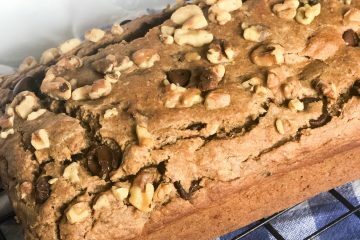 You must disclose this recipe contains nuts if you serve to others. This is perfect for the holidays. Apple and cranberry work so well. Looks like a tasty festive desert! I have that apple peeler/slicer! I love it! Your pastries sound and look delicious.